Everyone would agree with me if I claim ‘Current age is a total technology-based age’. Technology has taken control of almost every aspect of our life, education is first on the list. Yes, gone are the days when a student would complete his or her graduation just with a notebook and a pen. Nowadays the use of technology has become an unavoidable mainstream. It has done this so by taking the form of Electronic Gadgets. And in the life of a student, the introduction of such an electronic gadget might be a PC, laptop or a tablet to name a few. To complete daily based assignments, make presentations, get done with the research computer is a “very much likely to have” thing. 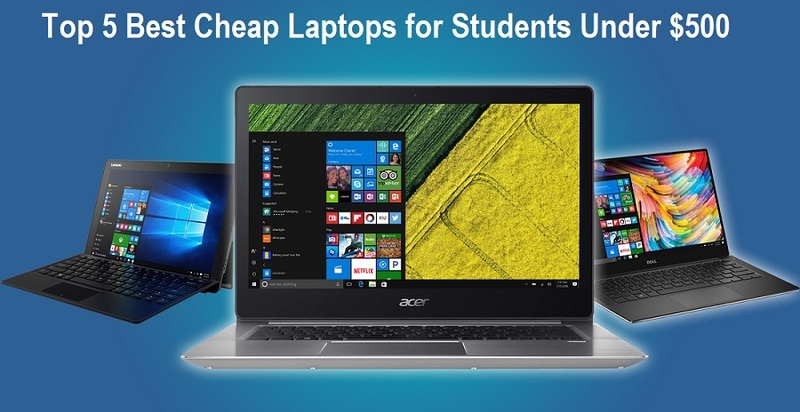 But obviously for students, best choice remains laptop- carrying laptop along from home to university or college and vice versa. A plenty of affordable options are available for the students out there on the market. But what is the utmost arduous task? Yes, you got it right! The Selection, of course! To make it easy, I have reviewed 5 best laptops for students of reasonable price with a set target of under $500. Lenovo has gained a good place out there on the market among the best laptop selling companies. Each time offering a product even better than the last model, Lenovo is constantly giving its users opportunities to make use of them to the best. Because of Lenovo’s stable reputation in the market, it is able to do so. One of its models best for students and even for professional use is the Premium Lenovo IdeaPad 330s. Both its look and performance can get you an edge. Its outer is guarded with a protective finish from wear and tear. Coming to its performance, this model is outfitted with a powerful Intel Processor. Now you can enjoy a full package comprising of plenty of memory, quick responsiveness, HD display and much more. Run a number of programs at the same time as it is a multi-task thing brought to you by Lenovo. HP’s this family member can stand one of the best choices for students. Because of its Intel Core Processor, now a student can make use of a lot of software and run transitions between web tabs. It is featured with diagonal HD display, 8 GB memory, 1 TB Hard Drive, Wi-Fi, Bluetooth to name a few. 17.3 inches screen gives it an aesthetic look. HP Premium remains the best option for students to have in their backpack or on the table right in front of them. Apart from its decent look, it has instilled in it a multi DVD drive, Audio with Stereo speakers, a front-facing webcam with an associated microphone and up to 7 hours of battery life. All of the above-explained features give it a life making it an entertainment worthy thing as well. Lenovo has launched its legend in the form of Thinkpad T440S. This offers a long battery life, best performance, best keyboard, and an optional touchpad all in one. Look-wise it has a smooth, black casing with a soft touch. Images provided by its wide display screen are vibrant and sharp enough. The display is quite responsive to all gestures. Speakers outfitted are loud so that a room can be filled fairly. It offers a comfortable typing experience due to its widely spaced keys and a backlight. Via trackpoint or touchpad, a student according with his ease can use a laptop. The best performance comes with its instilled Intel Core Processor, 8 GB RAM, and an SSD. While working it is a fast one performing different functions in less time. It is also provided with a variety of battery options so that a student can accord his workload. Panasonic CF-52 like its other siblings has the same size and shape. It is the first version of its series to offer a wide display screen. It has a fully rugged casing made of magnesium alloy. Due to the handle that has also been provided, C5-52 makes it quite portable to carry. A more rugged look has been given to it via this handle and flap. Basically, it looks a briefcase. Therefore, students can carry it along easily while rushing from class to class. While carrying if drops from a certain height, it can withstand that drop means because of a high durability grade. Similarly, with a provided hard casing, C5-52 is weather resistant as well. This model of Panasonic comes with a 15" of widescreen in comparison with the other members of its family. So, one can have a great experience of using a widescreen anywhere anytime. One of the good-looking and best performing laptops is the ASUS Chromebook Flip C101PA-DS04. This gives its users feasibility in carrying because of portability due to lightweight. A long-lasting battery life is an ice on the cake. Its display can get fold around and back at 360 degree offering many ways for its usage. With its slim flip even if ASUS is folded it looks sleek, easy to use and carry. Besides great display angles, stereo speakers give a quite clear sound. Keyboard’s keys spacing conveys a decent key travel. A 100GB of Google Drive cloud storage along with local storages offers you a plenty of storing capacity. Equipped with Quad-Core Processor, this stands unbeatable because it gives an extra impressive performance as compared to other Intel Atom processors. All in one line, the actual user can have a surprisingly smooth and sturdy experience. Now, you might have got the idea of what is best in what for you and you can easily go for the best choice that accords your needs in all possible ways. Keeping your budget in mind if you are looking for a cheap laptop that can still perform well, my recommendation to you is Panasonic Toughbook C5-52. Not only your affordability but feasibility also lies at the forefront with this Panasonic C5-52. HP Premium 17 and Lenovo Thinkpad T440S would cost you almost the same, here you can correspondingly to your will select either. However, if you are not a budget-conscious student and can purchase a laptop up to 500 dollars, say if you want to have the most aesthetic mate- a laptop, then Premium Lenovo Ideapad 330s is no doubt a solid choice for you. But all and all keeping it average my personal recommendation to the students out there is ASUS Chromebook Flip C101PA-DS04 after reviewing above 5 laptops. And the main reason behind it is its most affordable price yet with a sleek design and great portability. Even a low budget student can afford this. I hope you found this article helpful. Still, if you have any questions, do not hesitate to drop a comment below.